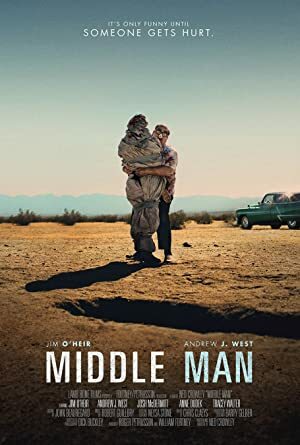 Middle Man (2016) – What's New on Netflix Canada Today! Lenny Freeman is a straight-laced old-school accountant with a dream; to become a famous stand-up comedian. The problem is he’s not very funny. Not even close. When his mother dies, leaving him nothing but debt and her ’53 Oldsmobile, Lenny hits the road to chase his dream in Vegas and auditioning for Monte Guy’s annual “Stand-Up Stand-Off”. Along the way (and against his better judgment) Lenny picks up a mysterious traveler named “Hitch” and his trip quickly turns from bad to worse when they stop at a small-town bar. Lenny jumps on stage as a warm-up act, but a run-in with a heckler leads to murder. Now with a dead body in his trunk, Lenny and Hitch are on the run. As the body count piles up, Lenny tries to free himself from his psychotic sidekick and escape to Vegas with the girl of his dreams. But Hitch won’t shake so easily. They’ve got a contract. And the devil is in the details…literally. Not to mention the fact that all this blood and mayhem is having a strange side-effect on Lenny. It is actually improving his comedy.